I've been trying to include less meat in our diets lately. Having once been a vegetarian for seven years, I've strayed pretty far from my no meat days. And all the research out there about the benefits of eating a more plant-based diet is pretty convincing. Decreased blood pressure. Less heart disease. Lower cholesterol. Healthier gastrointestinal tract. All good things. I have mentioned this before but now that I've added meat back into my diet, I sometimes find it difficult to think of meal ideas without meat. Weird, I know. Of course there are always salads loaded with vegetables but I wanted something more substantial for dinner last night. I decided to be adventurous and make my own black bean burgers. The result? Pretty damn tasty. Easy, too. In a large bowl, finely mash the black beans with a potato masher or a fork. Add the onion, red pepper flakes, smoked paprika, Worcestershire, hot sauce, cilantro, egg white, quinoa, flour, salt and pepper. Mix well. Form into 4 patties and arrange on a platter. In a large saute pan over medium-high heat, add the oil. Sear patties for 3 to 4 minutes on each side until they have a nice crust. Remove the patties to a paper towel lined platter. Assemble the sandwiches on a bun or multi-grain bread with a patty, some spinach, a slice of cheese and your favorite condiments. Enjoy. So we didn't have any eggs in our house yesterday and I didn't feel like running to the store so I improvised with some weird concoction of olive oil and milk. I don't know what I was thinking but it sort of worked. Obviously the egg white is included to help keep the patties from falling apart when you are cooking them. Somehow I thought that adding the quinoa would help (it did) and it also became a yummy and healthy addition to the recipe. Does talk of a potentially healthier you persuade you to eat less meat? Yep. It certainly does. Maybe this isn't even related but when I was a vegetarian, I was definitely at my thinnest. But I was also living in So Cal, which I'm sure had something to do with it, too. 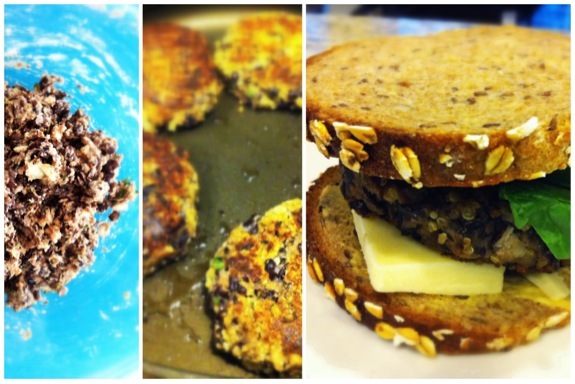 Those look so delicious - I love a good black bean burger. My diet is pretty similar - a once vegetarian, then added fish occasionally, then adopted my fiances habits and ate any meat [and anything really] and gained 30 lbs over 4 years! I'm finally back on the meat as a rarity track and I feel so much better - not to mention lighter. I totally know what you mean though regarding a meal not feeling complete without meat. I feel like in our society - at least in my house growing up - meat was always the center of the meal and anything else is just bonus food. Whenever I'm vegetarian I usually expect that at least half the time it's going to feel like making a meal out of a bunch of side dishes.